The RT70 comes in only one version, but as stated above, this body is available with a different emitter, and a different name. The RT35 is the thrower of the family. I received this light from a new site on the scene, GearVita. The Imalent RT70 is available there for $137.99, but I was able to get a great coupon, which takes $60 off: Coupon Code: RT70Light. Price after coupon: $77.99!! Those are tracking links there. I love the RT series from Imalent. Honestly Imalent has made one of my all time favorite lights, too (DX80). I like the RT70 too, and certainly at $78 it seems like a good buy! This is the standard Imalent “big light” box. There’s a protective cover over the lens. You’ll want to remove that. The manual is quite thorough. The build quality of the RT70 is the same as the build quality of the RT35. I’m satisfied with the build quality. I like all the fins on the head and body – they give the RT70 a very “flashlighty” look. Futuristic even. I like the way they look, and they’re functional too. As will be seen later, the amount of current this light uses needs some good cooling! The tailcap has a very “the cells are built into this light” look, but the cells aren’t actually built into this light. It would seem that all of this “extra” on the tailcap is basically just to make room for multiple lanyard attach points. I loooove the knurling here. It’s extremely well done, and extremely consistent. It’s a diamond pattern, which is my favorite, and has a flat top (also my favorite). This particular setup doesn’t have a lot of grab in the gripping; these grips could stand to be a shade taller. The driver is held in by two Philips screws (unusual!). The positive contact is a brass ring, as is the negative – no springs in the head end. All the springs are in the tailcap. They aren’t massive springs but seem to adequate keep the cells in contact when the light gets bumped around. Note here that the cells all go into the light in the same direction. More on that later. And finally, one of my two issues with this light. The threads on my copy were quite…. dirty. They’re lubed, but there’s an excess of lube. Also what’s there is completely blackened. As a result of the lube carrying whatever the black is, the threads are gritty. This isn’t insignificant. It’s also not the end of the world, since it’s easy to clean up and relube threads (something we should all do occasionally anyway). But for this to be a from-the-factory copy having these threads is a major annoyance. That said, generally the threads are nice – they’re square cut and anodized, but interestingly don’t seem to allow mechanical lockout. I can’t really explain this, unless this excess of lube is extremely conductive? I’ll have to clean it all up and see. The RT35 is powered by four 18650 cells. These cells need to be quite long, but capable of fairly high current. You’ll need good cells for this light – I stopped measuring at around 6A, and just HIGH draws over 4A. So the current used by this light isn’t trivial!. The cells I’m using here are specials from LiIonWholesale. Here’s that cell. It’s a protected MJ1 cell, and seems to work well in this light. Be aware that the light actually needs a quite long cell. I had a set of 3 Efest cells that were long enough. But button top 30q cells were not long enough. The cells are in parallel, so the light will actually operate on any number of cells. Even Turbo is accessible with a single cell, though I’m not sure the output will be “real Turbo”. This could be cell-quality dependent, and higher quality cells offering more current can perform better. Here’s a runtime on Turbo. I measured the 30 second output at around 2672, which is well below what the spec claims. That’s after quite a tumble from the initial output, but even then the output is well below specification. (More on this later). At the end of the runtime, the light just shuts off from around 550 lumens cleanly with no fade out. High runtime is fairly similar, with a heavy stepdown from the initial output, to around 1500 lumens. High of around 1300 lumens is maintained for a respectable 3 hours! At 3.1V, the red switch indicator was solid red. At 2.9V, the switch indicator flashed. At 2.7V, the light shut off. Charging is probably around 2A to the cells, and maintains this for almost 7 hours! Total charge time is around 8.5 hours to completion, but this will depend on the cells used, of course. MJ1’s are higher capacity cells. There is no trickle to the cells once charging stops. Even though this doesn’t look like all that “good” of PWM, I am not able to detect this by eye. There’s quite a bit of disparity between claim and reality there. I’ll name a couple of possibilities. The cells used might not provide enough current. I didn’t test this light over 6A, but at 6A it was still decidedly hungry for more. The RT35 tested to 15A. Since the cells are in parallel, meaning each cell is providing current in an “additive” way (so to speak), MJ1’s should have no trouble delivering the necessary current. But it’s still a feasible space for problems. The emitter in this light has an unusual beam shape, unlike any XHP70 I’ve seen. To understand more you need to know that an XHP70 is made of 4 die on one footprint. Based on the beamshots you can see below, I have a sneaking suspicion that one of these quadrants is dead. That might not fully make up the difference in output we can see in the chart, but it certainly gives us a fuller picture of the light…. More than half of the emitter isn’t working. That does explain the terrible performance. In the RT70 is a Cree XHP70 “2nd Generation” (which I presume means 70.2, though it’s not stated this way). The reflector is smooth, and as is demonstrated by the picture below, has a bit of a double cone shape. The problem I’m seeing is most evident in the lowest mode. See that half crescent in the bottom of the hotspot? That’s what makes me think the emitter could be faulty. Otherwise, the beam has a surprising amount of throw, with really not all that much spill. The tint…. not really a tint I’m used to seeing on a 70.2. But still as you’d expect compared to a Nichia. 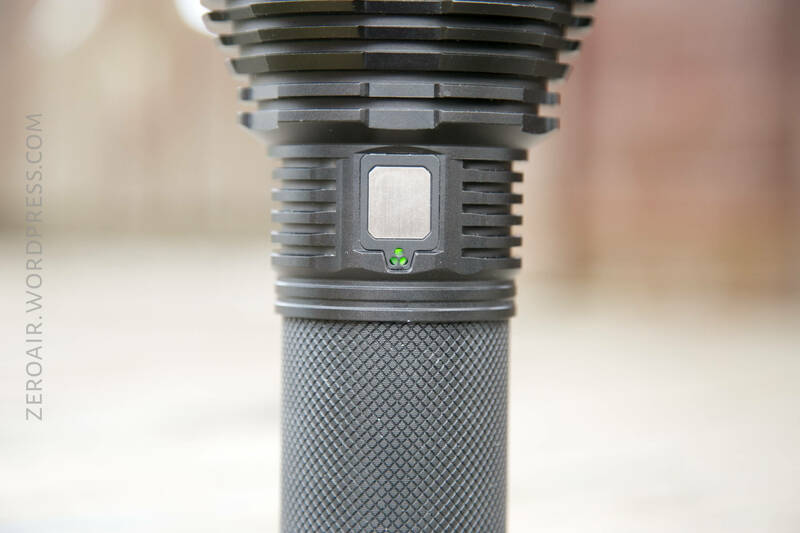 There are some other lights with the same emitter (claimed, anyway, 70.2), which also claim a much higher total output – the lowest of that mix being 5200 lumens. To wit: there are other similar lights with much higher output than this one. This one appears to be the only with an integrated charger, though. 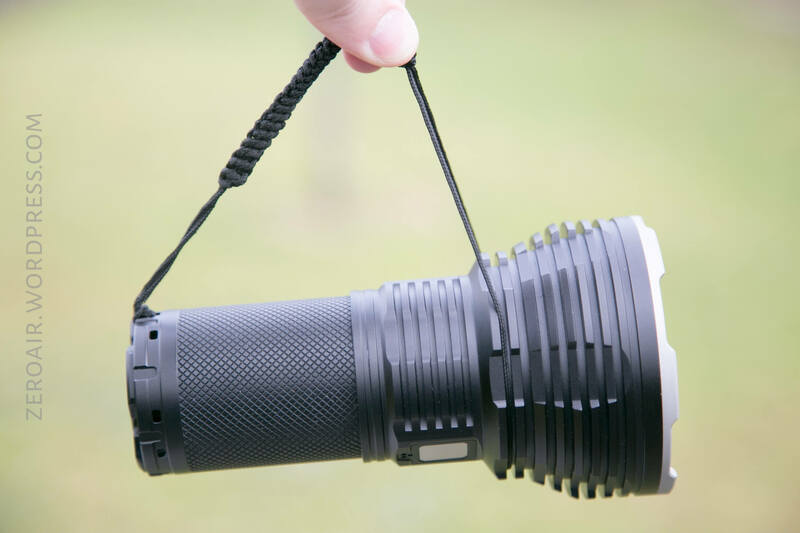 Also the others are Thrunite or Acebeam, and likely to be much more expensive than the sale price on this Imalent! I really like the switch, even if it’s a little hard to find in the dark, or by feel. This light was provided by GearVita for review. I was not paid to write this review.